Bill Bunn stands beside the whiteboard and waves his coffee cup in the air. He’s talking about following our joy, about ideas as balance beams that support us if we keep one foot in front of the other, about falling off when the idea gets flabby and soft and about finding our way back to the beam. The metaphor sings to me and I scribble notes, like everyone else around me in the circle. Next, he invites us to do a six-minute free write. I asked Bill to lead a writing workshop at Wonderscape precisely because I wanted to participate in a writing workshop at Wonderscape. But now that it’s time to participate, I can’t do it. I’ve got nothing. I hear Marea’s laugh in the hallway, the cooks preparing lunch, people breathing around the room and pencils marking paper, but my pen is as heavy as a mule that won’t budge. It gets even worse when I consider handling clay, picking up a paintbrush or plunging fabric into natural dye. Producing anything creative seems about as preposterous as launching a kayak and rolling it in the icy lake outside the lodge. Although I’m the organizer and facilitator of this arts retreat I have never felt like more of a poser. About halfway through the weekend it dawns on me; I’m too consumed with watching it come to life to do anything else. Like a mother gawking at her beautiful teenager coming into her own–all limbs and taller than she’d ever dreamed, with a distinct and separate personality–I can’t stop staring at what’s happened to my baby. This mix of awe, surprise, confusion and curiosity visits me before the weekend ever begins, when registrations roll in from across the country, and continues right on into the retreat. While I listen to the writer, the journalist, the potter and the painter confess their failures and share their successes with the group, while spontaneous, late-night jam sessions by the fire send everyone to bed humming “Black Bird”, while artists bring dazzling pieces to show and sell and while strangers recognize kindred spirits. I try to capture it, try to document it all on my 195-dollar Canon point-and-shoot, but I can’t get close enough. I wish I could get right in Sarah’s face as she lectures about horizons and painting and depth. I wish I could capture the rainbow of speckles on her black apron, her jiggy dance and how it feels to watch her pull oil landscapes (painted in the Arctic) out of her hand-made wooden box with the leather strap. My camera doesn’t record Marea’s generous laughter and her even more generous instruction. The way she shoves her feet, covered in plastic grocery bags into her Birkenstocks, to walk through the snow to her hand-building session. And it certainly doesn’t record the absence of complaints about the weather in general. How I apologized to Micheal in the breakfast line, knowing he’d driven for hours from northern Saskatchewan to attend the retreat for the first time. Before we all leave on Sunday we gather for the Artist Blessing. Usually this is my responsibility. In the past, I’ve thought about it for weeks, even months, ahead of time. I’ve laboured over each word and written a verse we all stand up and speak to each other. This time is different. Today, Shannon takes inspiration from the “Blessing Board”, a place where participants were encouraged to add their own phrases, thoughts and drawings. It’s more of a wild card this time. Will people write down anything on the board? Will Shannon be able to shape it into a song? Will this work? Will my baby fly? Shannon sits down at the keyboard and reads us the words to the chorus. Something from nothing is now a song; ideas that were loose and wild are now held tight by chords and notes. She plays it slowly and we practice. Then we repeat it. Only this time it’s a performance, a performance just for us. She sings the verses alone, the ones she’s just composed, and we join her on the chorus. Well, mostly everyone joins her, except for the ones like me whose emotion seizes their voices. When the last note is played I don’t want to clap. Don’t want to break the spell. Neither does anyone else. The room is silent. And still. I stand to face the group. It’s my job to facilitate, to hustle them through the lunch buffet and to wrap this thing up, but it seems impossible. “Food,” I say, “there is is food. Food downstairs.” Still, people remain in their seats. No one responds. No one even looks like they’re considering moving. I understand. I feel the same way. And then comes the flurry of packing, of gathering surveys, of emails and phone calls full of feedback and more ideas. We brainstorm about how it could be better and what it could become. I jot down notes. I can feel something happening; this isn’t Tricia’s baby anymore, it isn’t toddling around my knees, grabbing onto the hem of my pants. Wonderscape is stretching out, like any leggy teenager, growing into her place in this world. I’m wearing gloves and wielding a knife. Jalapeños litter my cutting board and papery garlic skins float along the counter. My mom is dumping a bowl of green peppers into the food processor when the phone company technician opens our back door and sniffs. “Mmm, smells good,” he says with an accent. Indian, maybe? He nods appreciatively and heads down the basement stairs, pulling wires behind him. I turn around and get back to work. For the next 15 minutes I’m in a dark corner of my basement, sorting through canning jars and looking for lids. At the same time he is stuffing the bag I gave him, harvesting every ripe and juicy tomato on the property. His shopping bag bulges to overflowing with produce. When I come upstairs with my load of jars he is gone. “Well he certainly took your word for it. He grabbed as much as he wanted,” my mom comments while looking out the kitchen window at the garden. The heirloom Brandywine tomatoes I was waiting for, heavy on the vine but not quite ready, are gone. As are the romas–the ones destined for another batch of sauce and the beefsteaks. “Mmm,” I respond at first, not too bothered. But then I start thinking of all the hours of labour, of starting seeds from scratch in my window, gingerly handling the transplants, mulching with last season’s leaves, of watering and tending. That’s when I get a little ornery. I had, after all, expected him to say “Oh thank you so much” and take a dozen or so back to his wife in Saskatoon. I had not expected him to ravage every last plant. I’ve been reading Braiding Sweetgrass by Robin Wall Kimmerer and loved her essay on generosity and gift economy. It gave me such warm fuzzy feelings in my armchair. I had murmured in agreement and savoured every word. Obviously, the philosophy of lavish generosity is easier for me to swallow than the practise. The earth on the other hand, especially at this time of year, seems to stick to the “no holds barred” motto. We spin out honey, stuff moose sausage, make wine, dry garlic, catch fish and yet we still can’t keep up to her. Gifts spill over and around us. PREFACE- Six days. Three boats. Four adults. Six kids. Five portages. Three bears. Zero attacks. EPILOGUE – I lay in bed for 2 days after the trip. I thought I had maybe caught a bug–my whole body ached and my fingers felt arthritic. Turns out I was just recuperating from all the character-building portages. Tara and I paddled with 4 kids. Our canoe was dubbed the “voyageur school bus” or the “party canoe”. The men and two other kids traveled with the gear. In a few years those delicate bodies pictured above will be strapping young men and women able to shoulder most of our weight. What a day that will be! They owe us a canoe trip or two. Back to school. Back to routine. Back to sticking around our home. Summer is fast, furious and fleeting like the heat. “You can sleep in winter; we don’t have time for that in summer,” I tell the kids when they tire of our pack-go-unpack-repack routine. With all of this going it has been hard to squeeze in writing. I still want to find words for speaking at camp, kitchen parties and growing food but am not sure when it will happen. I have started an essay about canoe tripping and listening. I will submit it somewhere eventually, because that’s writers do. That’s when a writer is successful–when she is submitting, not when her article is accepted, not when she’s long-listed for the CBC non-fiction prize (which I wasn’t, Kirsten) and not when an agent hunts her down. She is successful when she cracks open her laptop. When she punches out a jumbled paragraph, when she lands on a metaphor in the shower. A writer is successful when she’s writing. Can you tell I’m getting ready for Wonderscape? And can you guess what the theme of the retreat is? Well, it’s been four years and here they are, fighting at the table, each older sister desperate to show Vivi how to draw an uppercase E at the same time. This is a kind of bickering for which I am entirely grateful. I’ve written so much. Thanks for reading. I’m fighting with filing cabinets and piles of receipts and spreadsheets and my eye-lids feel heavy. I hate financial record keeping! Two hours later I’m still shuffling papers, trying to prepare my final Wonderscape report for the Saskatchewan Arts Board. Maybe I need to eat. Maybe I need to sleep. Maybe I need to take a break from all this. A moment later I come across the Artist Blessing I read together with my fellow Wonderscape participants last September. sensitivities and passions that no one else can replicate. to give what nobody else in the world can give. May your eyes be opened to the abundant opportunities. inviting you to enflesh, name, and reflect Beauty. May your work replenish, surprise and awaken you. with more new ideas than you could ever hold. …The only reason I can half-stand what I’m doing today is because I’m already excited about the next retreat (Sept. 2018). Still hooked on this. I find her online by accident. 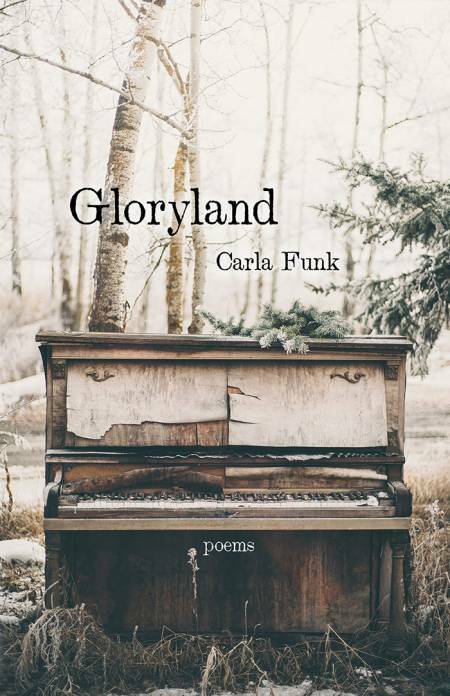 Who knows what I was researching, but when her website loads onto my screen I think I found it: Carla Funk…writer, reader, glutton for joy. Suddenly I feel like I am staring at exactly who I want to be. Every click leads to something beautiful and funny and real and satiating and lyrical. I pause just long enough to open another window and order Gloryland, her latest poetry book, from the library. I message Carla right away and tell her how much I love her. It’s forward of me, I know, and perhaps even a little annoying (barging in through Facebook’s back-door), but I have an ulterior motive. Wonderscape 2017 is approaching and I wonder if maybe, just maybe, she’ll be in Saskatchewan that weekend, and might she possibly consider attending the retreat? For free, of course! I type out my awkward flattery and wait. Surprisingly, she replies. She is kind and courteous but happens to be busy that weekend. Flying off to New York for some writerly thing. Ah, yes. Of course. New York. I now feel silly that I thought she might come to Wonderscape and we would meet and she would share all her writing secrets and we would be best friends forever. Gloryland arrives a few days later. My intuition about her is confirmed. Usually poetry volumes like this leave me disoriented and confused. Hers is different. It’s full of earthy, grounded writing. Humble in a fleshy, joyful sort of way. I keep it on my lamp-stand and nibble on a poem or two, every night, as a bed-time snack. *Note: If you know Carla, can you put in a good word for me? Or convince her to come to Wonderscape next year? Canada isn’t that big… she lives on Vancouver Island and her last name is Funk. Which is practically Friesen, for goodness’ sake. This post should have been a part of wordy-things I’m loving but I forgot. Which is okay. Carla deserves a post of her own. Nathanael crouches and drops bean seeds into the trench I made with my hoe. Vivian is there beside him and throws her handful into a pile and begins to cover them up, all lumped together. When I protest, Nathanael squints up at me and stares. Nathaneal isn’t convinced. “You can’t be a farmer because you don’t have a barn,” he concludes. I agree with him partly–barns and outbuildings are very useful things for farmers to have, and then we keep working. And finally, one last advertisement. Last wkd was mostly all backbreaking work except for Sunday afternoon, which was mostly all about water, fresh fish, fire, and friends. PS. If you haven’t been getting notified when I post (and you’ve signed up for email notification) try entering your email address again. If that doesn’t work, leave a comment and let me know!